There are a lot of options out there, ranging from very cheap - you basically build the workstation yourself out of wood you buy - to very expensive, which would be great if you're Eric Clapton or Bruce Springsteen, but probably less great if, like me, you're on a budget. The Etude workstation is manufactured by Chief, headquartered in Savage, Minnesota. As you can see from the picture on this page, it's quite basic in nature, and the words "skeleton" and "skeletonized" come up a good bit in discussions of the Etude. At first, this put me off, but I've come to accept the minimalist design as a good thing. I originally wanted a workstation in dark wood, which would have better matched other furnishings, but now have decided to wait until I've become enormously wealthy from my musical endeavors, at which point I'll move into a large estate, set up a grand music room, and hire some steampunk artist to design and build the mother of all walnut-and-brass workstations for me. The beauty of the spare design is that you have access to everything, front and back, which makes a lot of sense. So - how big is the Etude, and what does it look like "in person?" The overall dimensions on the manufacturer's website (and, hence, just about everywhere else) are incorrect. With the legs attached, the workstation is 57 inches wide, not 55. The height is about 38 inches. The depth is about 30 inches, with the sliding keyboard tray slid in. My MIDI keyboard, which is 76 keys, fits easily on the middle shelf, and a lot of websites say this workstation would accommodate an 88-key keyboard. The metal parts, which are powder-coated black, are made of 16-gauge steel, and the three shelves - top, middle, and keyboard tray - are compressed wood finished in ebony fleck laminate. The whole thing weighs about 100 pounds. It was shipped in three boxes, and well-packed, which was good because it looked like the boxes had gone through a war zone before arriving at my home. After the legs are attached to the cross-section, put the feet on. Assemble and attach the slide-out computer keyboard tray and rails and attach them to whichever shelf you want (most will choose the middle shelf, as pictured) before attaching the shelves to the legs. Attach the shelf mounts to the legs, but don't yet fully tighten the screws. Attach the middle shelf before the top shelf, but wait to screw the shelf to the shelf brackets, or at least don't fully tighten the screws. Attach the top shelf, but wait to screw the shelf to the shelf brackets, or at least don't fully tighten the screws. Check out whether you like the height and location of everything, maybe by pulling up a chair and pretending to play your keyboard, type, etc. Then tighten all the screws. The picture shows the top rack as far back as possible, and the middle rack as far forward as possible. You can adjust this, but that won't get you any closer to the wall, because of the legs. Regarding height, I ended up with the middle rack just one spot shy of the highest position, and with the slide-out computer keyboard shelf as close as possible to the middle shelf while still able to accommodate a keyboard and mouse. Now that I have my Etude workstation assembled and set up, I am happy with it, basically because it does what I need it to do. A large part of my decision came down to available space and equipment. The Studio RTA Wood Computer Desk would not have worked for me, at least partly because it's not really wide enough at 45 inches. The Studio RTA Producer Station was, on the other hand, too wide at 72 inches. 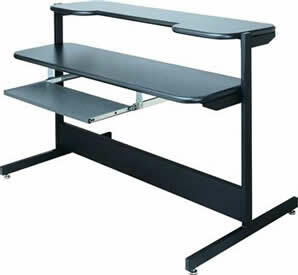 I also read online somewhere that someone bought this workstation and had problems because the rack holes did not line up on this workstation, and that would have been a major problem for me; when you're buying something this heavy, you don't want to have to return it. Some features on other workstations seemed enticing at first, but were ultimately deemed unnecessary. I really don't need CD racks for anything, and I actually did not want wheels on a workstation. Wheels always sound like a good idea on something this heavy, but they never are, mainly because they break after a month or two. It would be nice to have my CPU off the floor, and you can actually buy as an accessory a printer/CPU shelf for the Etude that attaches to pre-existing holes on the legs toward the bottom of the Etude workstation. There's no picture of it anywhere on the web at the moment. I contacted Kyle Larson, Senior Web Designer at Milestone AV Technologies (which owns Chief) about this, and he responded quickly, saying: "I don't have a photo currently available to me, but hopefully we'll have one to add in the future. I did check with our racks product manager for some information on the product and it does span the full width to attach to both desk columns. The height adjustable holes put the surface of the shelf 12-17" off the ground." I've seen the shelf advertised online for about $120, and might get it some day. In the interim, I think I'll just use an adjustable CPU holder, because I have my printer on a different desk, and it might be a pain to have my printer/scanner/fax machine somewhere between my knees and ankles instead of on top of a desk. So yes, I do recommend the Raxxess Etude Workstation. It's strong and stable, and the adjustability let's you play/record/compose/type in a way that's personally comfortable to you. Once you load your keyboard and other gear on the workstation, it looks pretty darn professional. If I were the product manager for this product (I used to be a product manager), I'd probably have at least one photo of the workstation available on the web that shows it with a lot of high-end, cool-looking MIDI and computer equipment on it. For now, you just have to imagine it that way.